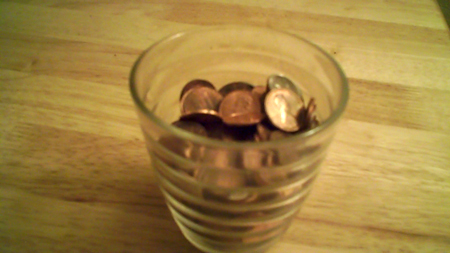 There are more than a hundred pennies crammed into a corrugated tumbler on my desk. I am not particularly interested in imbibing this elliptical manifest, but the thought of putting my money where my mouth is might allow for a strange and stomach-destroying hobby. The pennies share this impromptu open-air housing with a few random dimes and several Canadian coins left by the person who used to live in this room. I can only assume that this ex-roommate experienced a moral dilemma similar to my own, but I’ve been too polite to ask. It’s worth pointing out that, with the present exchange rate, the Canadian dollar is worth slightly more than the American dollar. There’s no easy way to trade in this small-time currency. My problem is hardly unique. This isn’t some drastic situation comparable to a Weimar Republic citizen rolling in a wheelbarrow of hyperinflated marks for a loaf of bread. Should I collect two or three more tumblers and bide my time, the currency, if accepted by a kind clerk, may very well depart from my hands. But I don’t wish to burden someone else with this problem. I’ve done my best to get rid of these Lincolns, offering two extra pennies on a $9.27 purchase, a gesture I’ve seen increasingly rejoined with confusion. I can’t very well put these into a tip jar or give it to someone on the streets. Beyond the insult, it presents again this needless problem of transference. I’ve tried shoving off these pennies one at a time, but prices have become more increasingly aligned with even sums. Somehow I like the penny, perhaps due to pleasant memories of now extinct gumball machines or the contraptions that flattened a penny into an ovoid souvenir. Nostalgia is a silly reason for holding onto anything, but somehow I can’t resist. I don’t support any of the half-hearted penny abolition movements in recent years. I regret that the pennies have accumulated, and take personal responsibility. About five years ago, I used to keep change in a small pouch within a unisex wallet. When I discovered that ATM cards, IDs, and stray bits of paper were escaping into my pocket, their journey hastened by a leather seam intended to contain, I was forced to conclude that the wallet had reached the end of its life span. I purchased a new wallet in haste, but it did not contain a pouch. I accepted this, and I began carrying change in my pockets, throwing the elliptical remainders into a porcelain mug. This tactic proved effective for nickels, dimes, and quarters. But the pennies continued to accrue. Because there were so many pennies, it was difficult to name them, but I was impressed by the deeper grooves contained within the 1960s and 1970s pennies (although the Lincoln Memorial sometimes loses detail, even when you can make out the Lincoln Statue between the two pilasters). It became easy to line them up by year and imagine the picaresque paths that had led them to me. Some of these pennies have been puttering around longer than I have. No doubt that many who have owned these pennies have not always appreciated them, or have kept them fleetingly. Perhaps a penny might be likened to a book checked out from a library. It is a coin more public and less inclined to be picked off a sidewalk. The penny’s value is too small to be of any serious capitalist threat. Maybe they’re now meant to be revered in moderation. ← Previous Post The Future of Magazines?